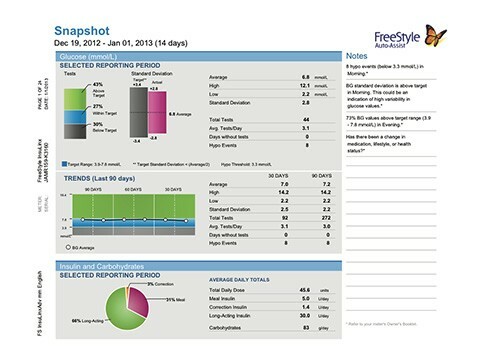 The Snapshot Report provides a data summary for a specified data range, including up to six notes relating to important blood glucose trends. 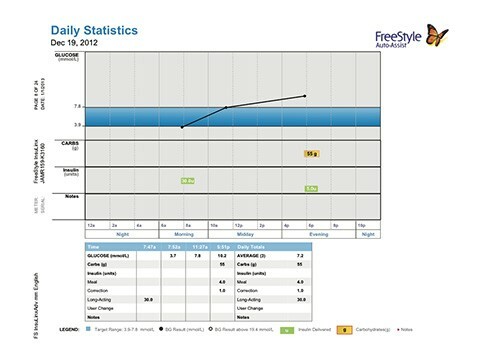 The Daily Statistics Report provides an overview of blood glucose, logged carbohydrate, and logged insulin data. 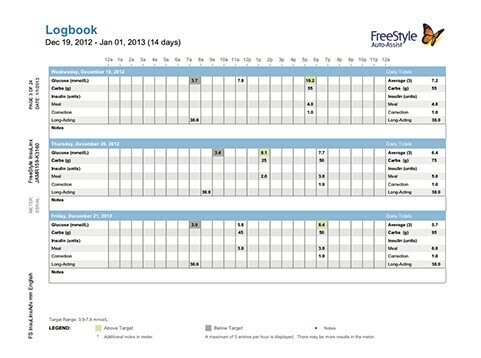 The Logbook Report provides a table of blood glucose readings, logged carbohydrate intake¹, and logged insulin doses¹ for each day in a specified range. 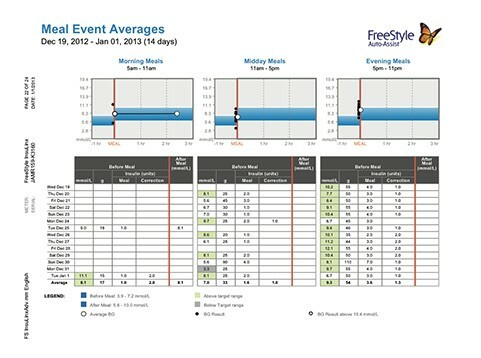 The Meal Event Averages Report compares before and after-meal blood glucose levels. 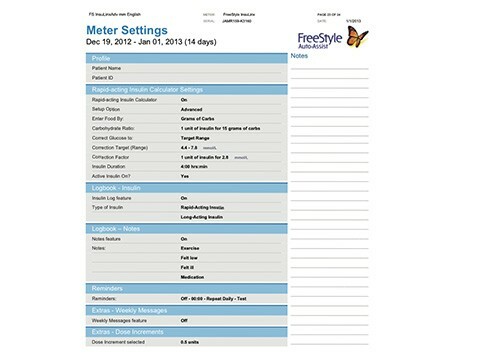 The Meter Settings Report shows you the current meter and insulin calculator settings and changes to the settings within the specified date range. 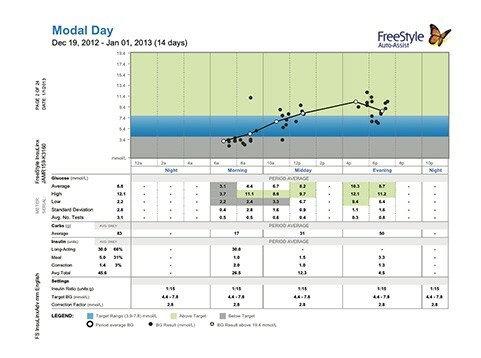 To use the software, simply connect the yellow USB cable² to your FreeStyle InsuLinx and your computer. The software will then automatically begin the installation process. Once the software has installed, you arrive on the MENU page. a) Select or create reports. By default, all reports are selected. 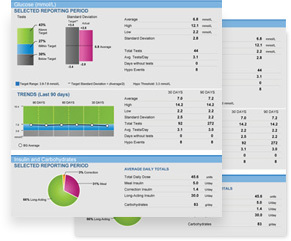 Check the reports that you want to create. b) Choose the time period you want to show data for. If you want your report to take into account the last two weeks. Select: last 2 weeks. c) Click View on the screen. The report appears on the screen automatically. Select other reports created using your cursor. Connect your meter and go to the MENU page. Or select the reports you want to print, click Print. By default, all reports are selected. 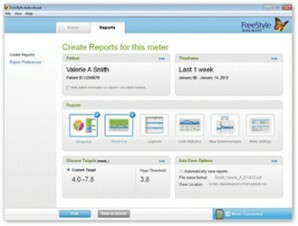 Check the reports that you want to create. a separate page. e.g. If 20 days of data have been selected, 20 pages will be printed. To limit the number of prints, select one print period only. Once you have created a report, click Save. 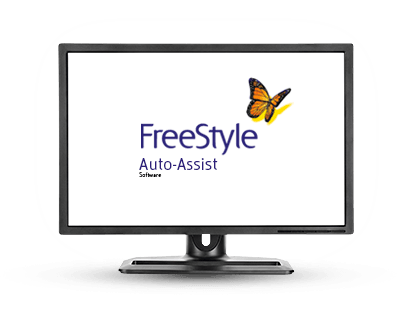 FreeStyle Auto-Assist for FreeStyle InsuLinx, then upgrade to the new version for compatibility with FreeStyle Optium, FreeStyle Freedom Lite and FreeStyle Lite. Operating Systems supported: Windows XP, Vista and Windows 7; Mac OS Snow Leopard and Lion.